Welcome back. This week it’s live from Branson, Mo. where even an F2 tornado has done little to slow the flow of visitors. Although Branson’s Variety Theater where the Twelve Irish Tenors perform was heavily damaged, the Victorian Hotel, which is right next door, was untouched. The theaters where some of my other favorites perform including the Duttons, The Presleys, my friend Jim Stafford and The Baldnobbers also had no damage at all. A couple of the famous ducks which weigh more than two tons apiece and cost $350,000 each got flipped over but I am happy to report they’re back in action now taking people out on Table Rock Lake for a ride you don’t want to miss when you’re here. The Hollywood Wax Museum featuring King Kong sitting 100 feet in the air on top of the Empire State Building also had no damage even though T-shirt shops on both sides were destroyed. I saw little damage to the Branson Landing area of shops and old town also reported no trouble. The Hilton Branson Convention Center hotel near Branson Landing had more than 100 windows blown out but in order to make them all match they are replacing 3,800 windows and anticipate that they won’t be open until September. An area around the Monster Museum including a hotel and smaller strip mall did suffer major destruction along with several fast food joints but construction crews are already putting them all back together. Silver Dollar City had no damage at all and that area of the strip looked normal. The giant White Water Park and the Showboat Branson Belle whose seasons are just about to start, along with the Yakov Smirnoff Theater and the Oak Ridge Boys’ show house were all spared. To sum up, even though the damage totals in the millions of dollars it is miniscule in the big picture and no lives were lost. Malls are open, variety shows are going on every day, Silver Dollar City is open and the traffic on Route 76, or the strip as I call it, is back to normal “busy”. Now is also a good to go before school gets out, there are discounts everywhere, hotel space is plentiful and the spring weather’s fine. It’s a nice time for a dinner cruise on Lake Taneycomo which I think I’ll do right now. Biographies of famous people have also been my greatest interest so I was immediately attracted to these two exhibits…. Welcome back. 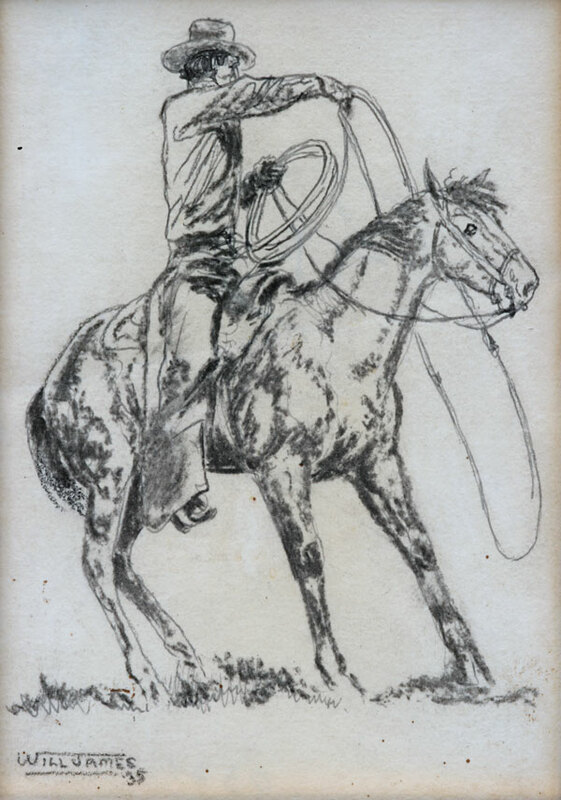 A few months back I wrote a piece about the artist, author and cowboy Will James. The self portrait he painted on a wall in a remote line shack on Waite Phillips’ UU Bar Ranch that I had just viewed spurred my interest in his life. With that said I’ll come back to the present day and start off this week telling you about an exhibit of his work that is on display at the Cowboy & Western Heritage Museum (which I still call The Cowboy Hall of Fame) through October 14th. The couple of dozen highly detailed pencil drawings are nothing less than fabulous. When you think of the conditions he worked in, many times drawing by the light of a candle in some cow camp, the beauty of his work takes on a whole new light. It is just hard to imagine how this self taught artist with a very limited education could have created these wonderful pieces. James was also an author and his books are on display along with several movie posters from the films that were adapted from his writing. Photographs of James along with handwritten letters tell the story of a colorful life that I knew little about until recently. It’s a life well worth learning about and definitely worth the price of admission. The Western Heritage Awards weekend is also coming up here on April 20-21, you long time readers may remember that I’ve attended this event for the past two years and its one of my favorites. Tickets to this one get hard to find as the date draws closer so if you’re interested, better hurry. This week I also had the opportunity to visit Gilcrease Museum where the “Woody at One Hundred: The Woody Guthrie Centennial Celebration 1912-2012” exhibit just opened and will be on view until April 29th. Born on July 14, 1912 in Okemah, Oklahoma, as many of you know Guthrie went on to world wide fame but this exhibit focuses on Woody Guthrie the man through his personal journals and drawings. These works offer insight into Guthrie’s experiences during the dust bowl and the great depression that led him to create the famous songs that have inspired Bob Dylan, John Mellencamp and many others. With their extensive permanent collections and special exhibits such as these, both museums offer a fresh perspective on our own experiences. I’ve met few folks who didn’t come away from a trip to a museum with some kind of new wisdom or vision relating to their daily life. With March madness upon us my travels continue with a trip to Branson, MO in the near future. Working in the writing field you sometimes travel many roads at once. Welcome back …. In the dictionary “luck” is defined as “chance,” “fortune,” “accidental” and “coincidence”. Picking Kathy Taylor to become Tulsa’s next mayor when she hadn’t yet publically entered the race several years ago was luck. Two years ago I also made the call on Tulsa’s current mayor Dewey Bartlett after I interviewed him, again luck. Last year I ran a story predicting that “The King’s Speech,” would win an Oscar when it hadn’t been released yet and this year I made the same prediction about “The Artist” before it was released nationally. As you may know “The Artist” recently won “Best Picture” at the Academy Awards and again this was probably luck. With basketball fever gearing up towards March Madness and after visiting with Eddie Sutton and longtime Channel 2 Sports anchor Big Al on Saturday, I am ready to make a prediction about this year’s tournament but first a little background on Coach Sutton. Eddie Sutton was born on March 12, 1936 in Bucklin, Kansas. In 1957 he was recruited from high school to play ball at Oklahoma State University under legendary coach Henry Iba and developed a life long love of the game. After graduation he got his first head coaching position at a community college in Twin Falls, Idaho which at the time had no basketball program. Sutton founded the men’s basketball program at College of Southern Idaho and the team quickly became a successful competitor at the community college level. Sutton left Idaho in 1969 to coach at Creighton University and made his first appearance at the NCAA finals in 1974 with the University’s Bluejays. Later in 1974 Sutton moved to the University of Arkansas where he revived their program and in 11 years the team won five Southwest Conference Championships, made nine NCAA tournament appearances and went to the final four once. Although successful and happy in Arkansas, Nolan Richardson would replace him when the most prestigious college basketball program in the country ,The University of Kentucky, came calling in 1985. Sutton had four very successful seasons at Kentucky but his career there ended abruptly when problems were discovered with the program’s recruiting policies and he resigned. A year later Oklahoma State University offered him the opportunity to rebuild a program that had stagnated after Coach Iba’s retirement. Sutton and player Bryant “Big Country” Reeves led the Cowboys to the Final Four in 1995. Today Sutton lives happily in the Tulsa area where he told me he is close to his grandchildren and attends his son Scott’s games at ORU. Getting to visit with this legend was sweet but hearing his prediction as to who will win this year’s March Madness would be even sweeter. Early that morning I had breakfast with Big Al and got his prediction about who will win the big dance this year and now Eddie Sutton! How could I go wrong? Last year I took home a big screen TV when I picked UCONN as the NCAA Tournament winner. This week I have a dilemma, should I keep my knowledge to myself and take home another TV or give it up to a charity? But then again all this hype about me, The Original Buffalo Dale scout, tracker, translator, interpreter and profiler you know could just be luck. Till then I’ll see ya down the road…. Interviews continue to take me to far off places and interesting people- One stop that coming up is Branson, MO where I will be checking out the tornado damage. Its always worth the trip and I hear that they’re getting back to normal already. With Glenn Campbell making a farewell tour across the country I hope this weekly column is of interest. Welcome back This week’s travels had me first checking in with photographer Jerry Poppenhouse whose next photo workshop will be held at Waite Phillips’ old UUBar Ranch outside of Cimarron, New Mexico. If you haven’t heard of him, Jerry had a twenty-eight year career with Phillips Petroleum Company, traveling around the world shooting photos in remote locations where many times people didn’t even know what a camera was. After retiring from Phillips, he went on to teach photography at OSU and his work has been published in numerous books and magazines. Jerry tells me that although the Lodge at the UUBar sold out the first day that the workshop was announced, he thinks that there is still a room or two available at the St. James Hotel in town. I also found out that Jerry and the other two instructors aren’t charging a dime for their time so the only expense for participants is their meals and lodging. If you are interested you’d better hurry and check with Sue at (575) 376-2035. I also need to mention the kids of Jenks High School this week since Saturday afternoon I attended a performance of The Will Rogers Follies at their performing arts center. Picking up Will’s grand niece who’s also his oldest living direct descendant and a person who often traveled with him, and now was traveling with me, you know it felt special. The musical tells the story of Will’s generosity toward mankind and for a Will Rogers fan sitting next to a person who witnessed it all first hand was great. Sadly, I have to tell you that the last performance was on this past Sunday and I am sorry if you missed it but the museum in Claremore is open year round so check it out. You can see photos from the Jenk’s performance on my sidekick’s Facebook page, Photos by Loretta Lewis. According to his official biography, this next man’s story started on April 22, 1936 on a farm in Billstown, Arkansas. A sharecropper’s son with twelve brothers and sisters, he picked cotton until his dad bought him a $5 Sears and Roebuck guitar and within a couple of years the world started to know who Glenn Campbell was. After performing on some local radio shows, he dropped out of high school and moved to Wyoming where he played bars and roadhouses. He soon moved on to New Mexico putting together a band called “Glenn Campbell and the Western Wranglers” and then took his act to Los Angeles where he got gigs with the Righteous Brothers, the Monkees and the Beach Boys. Over the years his career grew to include his own T.V. show, hit solo records and even a role in True Grit with icon John Wayne, making Glenn Campbell a household name. In the 1970s substance abuse, a tell all book and frequent tabloid headlines made it seem that things had fallen apart for Campbell but with the help of God and a new wife he pulled himself back together and resumed performing. After his recent announcement that he has Alzheimer’s disease, Campbell is making a highly publicized farewell tour across the country and his show at the Osage Event Center in Tulsa is already sold-out. If you didn’t get a ticket don’t worry, I’ll be there to bring you a report on the show and this great entertainer’s condition. Till next time, I’ll see ya down the road…….